For centuries, olives have provided mankind with food, been used for medicines and to alleviate symptoms and as an ingredient in care and beauty products. Today, 15 million tonnes of olives are harvested a year in Europe alone. The leaves of the olive tree have until now been burned after the harvest on the plantations. Now, a revolutionary process is enabling these leaves to be turned into a 100% sustainable tanning agent for the production of the finest leathers, the protection of health and the environment. The use of wet-green® technology means that saline and sulphuric acid no longer need to be used in the particularly gentle process of olive leaf tanning. The tanning agent oleuropein is so pure that it is also found in extra virgin olive oil. All of the residual substances that occur can be recycled 100% or can be reused. The waste water from the tanning process is completely cleaned in an entirely organic treatment plant. No conventional dyes are used in the finishing of olive leathers. Absolutely no dyes are used in the production of one type of BLATTWERK leather so that it can retain its truly natural character. The other BLATTWERK leathers are left in their natural, open-pored state after dyeing and some of them are protected against environmental influences using real beeswax. All versions share one characteristic: a fine olive scent that bears testimony to the origin of these exceptional leathers. 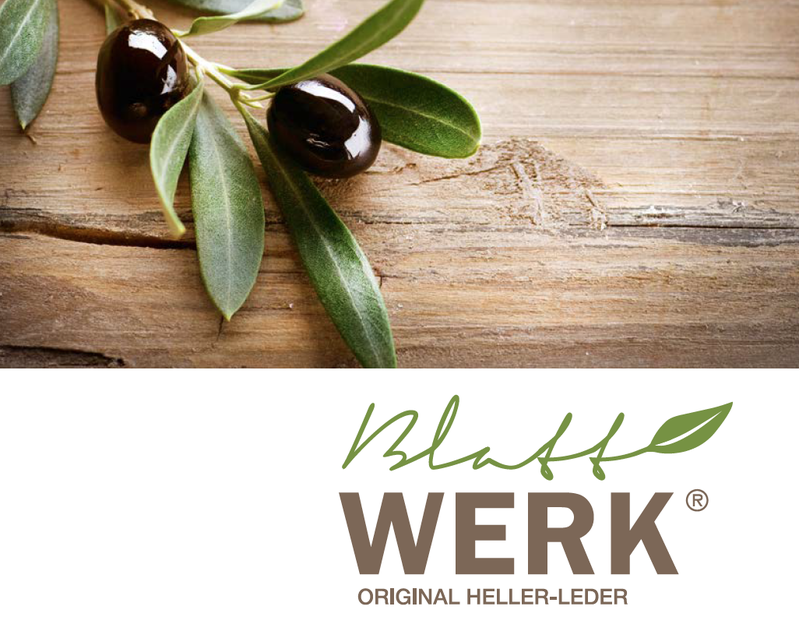 In order to pay homage to the highly unusual olive leather, a special label was created in 2012: the BLATTWERK collection. Thanks to our dedication and craftsmanship, Heller-Leder has created the „BLATTWERK original HELLER-LEDER“. Only the finest leathers from the factory are permitted to bear this name. Every product in the BLATTWERK collection is truly unique. We hope that every proud owner of one of these products will enjoy their truly personal piece of nature for many years to come.